Remote controls...everyone has them...and usually multiples! (tv/cable, sound system, apple tv...the list goes on) They can also be the ultimate eye sore and ruin a perfectly styled coffee table or end table! I try to keep ours in one of our end table drawers but they still somehow always magically end up on the coffee table. So I'm on the search for a storage box to house them/ not make my coffee table look like I'm still in college! While places like Homegoods and TJMaxx can be a great source there are also some great options online I have pulled. Just remember to measure your remotes first, especially the longest one, so that you have an idea of what size box you will need! 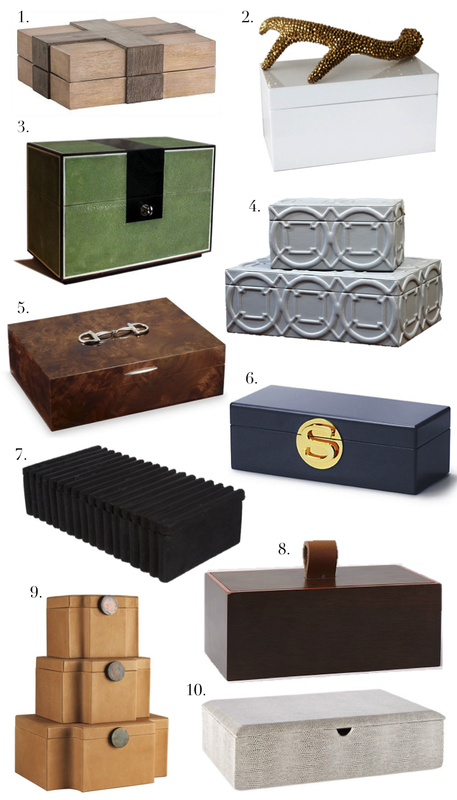 Also don't look past jewelry boxes, many times they have an interior compartmentalized tray that can just be removed.